Lagos State Governor, Akinwunmi Ambode, has ordered the immediate demolition of all ‘shanties”, structures around the creeks and on the waterfronts in Lagos, as part of a broader effort to rid the state of kidnappers, crime and filth. Media reports reveal that the demolitions will commence on October 17, 2016, after the expiration of a 7-day ultimatum given to residents to vacate the creeks and the waterfronts, mainly around Ibeshe, Baiyeku, Ikorodu Port, Ikorodu Industrial Estate, Ketu, Oworonshoki, Bariga, Makoko, Ebute Metta, Ilubirin (Lagos Island), Osborne Foreshore (Ikoyi), Park View Estate, Banana Island, Lekki Phase 1, Victoria Garden City, Ajah, Langbasa among others. First, Lagos State has a long history of making excuses for tearing down the hovels of the poor and forcefully evicting them from the places they call home. Beginning from July 1990 when the Lagos State Government appallingly demolished the 300,000-member Maroko community, the reason advanced for the evictions was that Maroko was unfit for human habitation and was in dire need of infrastructural transformation. Today, that same Maroko land that was unfit for human habitation is now occupied by the powerful and the affluent whose mansions and other magnificent architectural edifices are beyond the reach of former Maroko landowners. Lagosians have witnessed a repeat of this unfortunate Maroko treatment in Makoko, Badia, Pura, and many other locations in the State. Secondly, what Governor Ambode calls “shanties” are people’s homes, businesses, schools, and ALL that they have. Just days ago, Governor Ambode disclosed that there was the need for additional 187, 500 new houses in the next five years to reduce the housing deficit estimated at 2.5 million in the state. Houses built by the government and other private actors are reputedly unaffordable to the poor masses, and are therefore, traditionally bought over and occupied by the rich and powerful elites. Demolishing the existing housing stock within the reach of the poor does not sound like a brilliant idea about how to close this huge housing deficit in Lagos State. Thirdly, giving people without means only 7-days’ notice to vacate their homes smacks of executive insensitivity. Such extremely short notice is coming at a time when inflation rate towers at 16.5% and the economy is in recession, crippling social and economic activities, while triggering massive job losses. We particularly find it objectionable that the demolitions are scheduled at the peak of the rainy season. Any demolition exercise undertaken at this time would increase the vulnerability of urban poor families to property losses, inclement weather with health implications, and insecurity. Fourthly, crime-fighting is one of the excuses traditionally employed by successive administrations to order the demolition of the homes of the poor. When settlers on the waterfront are blamed for the recent kidnappings, and their homes demolished, this simply translates to visiting the sins of kidnappers on the urban poor who live by the waterfronts. This practice encourages the actual criminals to evade justice while transferring the blame to the urban poor. State authorities should not be seen using demolitions to provide cover for dangerous criminals. Fifth, a mega-city is not built by destroying the homes of the poor and driving them away from the city. Demolitions have never solved the problem of slum proliferation in the state, but have worsened the situation. Evicted persons never migrate to other states nor move into the formal neighborhoods inhabited by the upwardly-mobile inhabitants of the State. Demolition exercises only succeed in pushing the poor deeper into poverty, while forcing them to regroup elsewhere to re-establish new slum settlements. Sixth: Building social housing that is affordable to low-income and very-poor households is one way of ending slum growth. Delivering security of land tenure to persons living in areas regarded as ‘shanties” would incentivize the predominantly-poor occupants to improve their housing and living conditions. This approach is useful in the sense that it deflects the pressure on governments to pay compensation, resettle or provide affected persons with alternative accommodation. Seventh: Nigeria has voluntarily subscribed to the commitments espoused in the International Covenant on Economic, Social and Cultural Rights. According to the United Nations Committee on Economic, Social and Cultural Rights, ‘the right to housing should not be interpreted in a narrow or restrictive sense which equates it with e.g. physical shelter as a commodity; but rather should be seen as the right to live somewhere in security, peace and dignity.’ Implicit in this duty to respect the right to housing is an obligation on the LASG to adopt all appropriate legislative, administrative, budgetary, judicial, promotional and other measures required to realize the right to adequate housing for all (which includes improving housing conditions within the state) prioritizing for the most disadvantaged groups. Since September 2016, small and medium-scale enterprises as well as informal settlements in Lagos Island have come under the heavy pounding of Lagos State-operated bulldozers. Hundreds of families have been displaced and numerous businesses worth millions of Naira destroyed in areas around Ikoyi, Victoria Island, Lekki and Ajah (with communities Shapata-Chevron side, Small Kuramo, Ikate-Elegushi Waterside, Ikota-Ajah among others). These demolition exercises continue, unrestrained, till date. 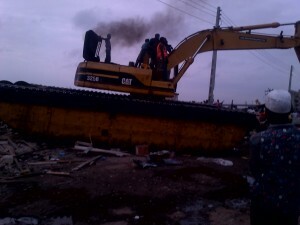 A number of state agencies such as the State Ministries of Environment, Physical and Urban Planning, Lagos State Waste Management Authority, Kick against Indiscipline (KAI) – an environmental law enforcement unit, and the Civil Defence Corps, have been named as the executors of the state’s demolition policies. Substantiated reports of overzealousness, high-handedness and intimidation by officials of these agencies during the demolition and eviction exercises, abound. Betty Abah, Executive Director of CEE-HOPE says: ‘it is a huge disappointment because many voted Governor Ambode in as governor of Lagos State based on the sensational promise of inclusive development. The demolitions in Badia East and other communities across Lagos since the governor’s assumption of office in 2015, the recent ban on street trading; and now these forced evictions and demolitions in Oshodi, Ikoyi, and other communities make it abundantly clear that he is on a mission to marginalise the urban poor even further and make living more difficult for them,’ she said. Effective remedies to affected persons, including opportunities to seek legal redress. CLP is one of Nigeria’s leading civil society organisations working to promote grassroots participation in governance and building sustainable and healthy communities. It works to enhance the participation of grassroots people, organizations and local institutions in promoting sustainable community development, electoral integrity and democratic accountability in Nigeria, especially at the local level. SPACES FOR CHANGE works to increase the participation of women, youth and communities in the development of social and economic policy, and also help public authorities and corporate entities put human rights at the heart of their decision-making. Famed for leveraging digital technology and crowd sourcing tools to conduct researches and execute high-profile policy campaigns, S4C continues to create spaces for debate and reflection, and in the process, facilitating public participation in the promotion, evaluation and setting of strategic policy directions on specific social and economic priorities.